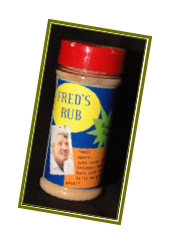 Fred’s Rub is a mix of seasonings concocted by my husband, Pat’s father Fred. Fred was quite the griller even back in the 50’s. I guess that is where Pat gets it from . . . it’s the grilling genes . . . not to be confused with pant that you wear when you are grilling . . . grilling jeans! Anyway, we use Fred’s Rub on a wide variety of foods. As I mentioned, it is a great seasoning for meats on the grill; steaks, burgers, pork chops, chicken . . . virtually everything except fish, sausage or brautworst. For your meats on the grill I suggest that you use Fred’s Rub with a pretty heavy hand . . . don’t just sprinkle it on, get a pretty good covering of it on the meat. We also us Fred’s Rub on potatoes, roasted veggies. Whether you roast your veggies in the oven or on the grill, it’s great! However, you will want to use Fred’s Rub sparingly on the veggies so they don’t become too salty. This is a story my husband Pat included in our recipe book: “Wedding Week at The Lark Inn” I hope you enjoyed it. Actually. the Fred’s Rub really is awesome and we use it in a lot of our food preparation. Tomorrow, we will be talking about our “Smashed Potatoes”. This are a very unique way to prepare potatoes, it lends itself to being savory, your guests (or family) will love them and, they are a great way to control your calory intake. See you tomorrow! Thanks for reading! If you are interested in more information about our cooking classes or the Lark Inn Guesthouses, please visit our website.